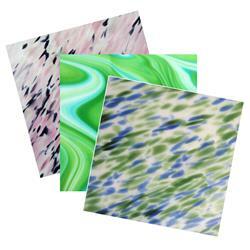 The Spectrum and Uroboros glass is available in 6" x 6" pieces, or 12" x 12" pieces. Use the drop-down menu to select the desired size. 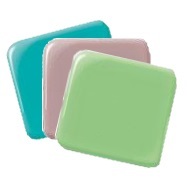 These Spectrum System 96 fusible solid opals are ideal as a background, upon which you can add colored frit, stringers and the like. Here is an exciting collection of Uroboros Fracture/Streamer and Fracture/Stringer glass that you can use "cold", as an exciting element in your stained glass creation, or "warm" -- alone or combined with other System 96 glass -- in your next fusing project. 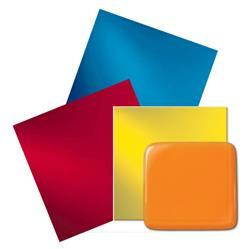 Spirit glass from Spectrum is a lively explosion of color that will add excitement to any piece. 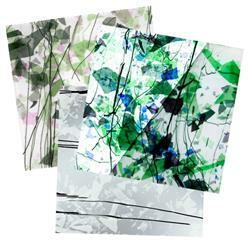 Opal Art has bold swirls and waves evoking motion, ideal for watery motifs. Fusible glass frit, stringers, noodles, etc., that have a coefficient of expansion (COE) of 90. Many of these items are Fuseworks products, specifically designed and tested for use in the Fuseworks Microwave Kiln. 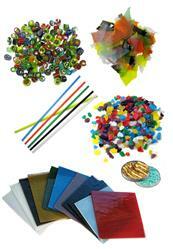 The Fuseworks products are ideal for your small fusing project. Cut a 2" x 3" sheet of glass into the desired shape, then add bits and pieces of colorful embellishments, place into your kiln (per instructions) and easy-peasy, you've got a unique work of art. Or at least a unique *something*.